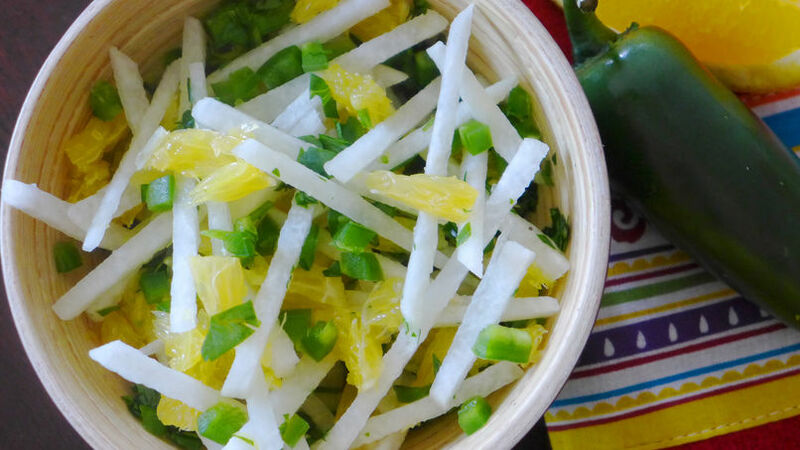 Place the sliced jicama in a large bowl. Peel and section 2 oranges. Remove all the white pith and chop into 1/4-inch pieces. Add the orange pieces, jalapeño and cilantro. Toss to combine. Add the juice of the third orange and salt to taste. Add arugula or baby spinach for a fuller salad. So far in 2014, I have to give myself a high five because my New Year's resolution of making healthier meals for the family has been going great. Being a food blogger and being around food all the time really makes it hard to keep my resolutions going, but I'm up for the challenge! Eating healthier certainly doesn't have to mean eating bland food. I've been into really crunchy salads lately and have been trying to decide what to do next. Jicama is one of my favorite veggies. It's low in calories, is a good source of fiber and is very versatile. I'm the kind of girl who likes to have a little spice in her meals, so this week I made a Spicy Jicama Orange Salad that will make your mouth water… and maybe your eyes too!